Bowser's Hit-or-Missile Mania is a Boss Battle minigame in Mario Party: Star Rush. It is one of the three Bowser-themed Boss Battle minigames in that game. The minigame name is a play on the phrase "hit or miss". Players need to mash to fill up a meter that launches missiles at Bowser. The meter goes in three tiers: one missile, two missiles, and three missiles. 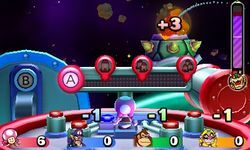 When a tier is reached, the player launches the number of missiles indicated, and can continue mashing to go to the next tier, until the player has launched three missiles, which resets to zero. Players receive one point for every missile hitting Bowser. In the meantime, Bowser launches missiles at players, where players need to press to deploy the shield to protect themselves from the missiles; while the shield is up, players cannot mash . If the missiles strike the player, the player gets stunned and loses one point. The missile meter also slowly resets to zero if it got filled up in the meantime, so when the players recover, they have to fill the meter up again. When Bowser has half of his HP depleted, he gets angry and turns his shell machine into a Bowser mech. Here, he tosses much faster black Spiked Balls at the player, as well as lobbing the red Spike Balls out of sight, where the only indication that it is coming is the alarm sound effect. If the player deals the final blow to Bowser, the player earns a bonus three points. In Toad Scramble, Bowser drops two Stars upon defeat. On-screen (Before game starts) – "Mash to launch missiles!" This page was last edited on October 6, 2018, at 09:48.